Listen to your voice, it's talking to you! On our recent trip to Bradford for IVA Teacher Training, I was inspired to write this blog post based on observations and conversations that we had during the teacher training. As singers, one thing that we must do is look after our voices. After all, you only get one set of vocal cords! More often than not, we’re not listening to what our body is trying to tell us as we go about our daily lives. It’s so easy to overdo it with your voice; talking too loud in a noisy environment, pushing too hard for high notes, singing too loud, singing too hard when not warmed up and singing for too long are just a few examples that we can all be guilty of at times. Prolonged periods of this can leave you with a compromised voice which can eventually lead to vocal damage. And that’s something that none of us want in our voices. Raising awareness of vocal health, known as vocal hygiene, is a big part of what we teach at Your Voice Studio. We want singers to have healthy, fully functioning voices. But there is only so much we can do as teachers. The rest comes down to you! 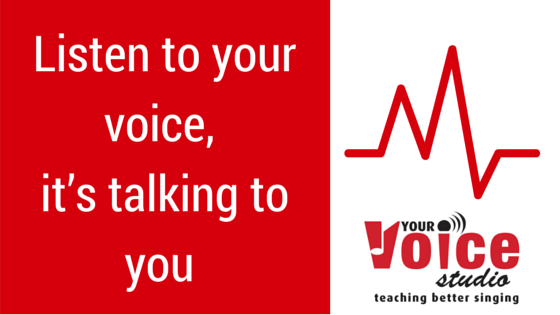 Your voice is precious, you use your voice every single day to communicate, so you have to look after it. Your body is an incredible machine, and is very adept at giving you signals when something isn’t right. And to maintain good vocal health you have to listen to it. Too much phlegm, a dry throat, tired voice and a raspy tone to your voice are all signs of something going on with your voice but many people ignore them. Over time, those symptoms can worsen, or the condition of your voice can deteriorate, leaving you with new problems and issues to face. But you can stop that all right now by just listening to your body and taking care of your voice. See a doctor, or a ENT, or get a vocal assessment with us to find out what is going on and what steps you need to take to remedy the problem. At the end of the day, I’d rather go to the doctor and be told that nothing is wrong, than struggle with vocal issues in the future.